A new in-wheel electric motor designed to make it easier and quicker for manufacturers to develop EVs is due to enter production later this year. The weight-saving technology, called the Protean Drive, has been under development by Farnham-based Protean Electric for the past eight years. The Protean Drive is a completely self-contained ‘smart actuator’ that includes a permanent magnet and synchronous electric motor, as well as the electronics needed to make it work. Each motor produces 81kW (109bhp) and 922lb ft, so a two-wheel-drive electric vehicle could conceivably produce peak power and torque of 160kW (214bhp) and 1844lb ft. Using self-contained wheel motors such as the Protean Drive eliminate transmissions and driveshafts and free up space in the centre of the car between the driven wheels. Cabling is minimised – two cables supplying power and another smaller one used by the main vehicle computer to control the motor. Donaldson says that, at 72kg, a pair of the motors weighs 30kg less than the electric drivetrain of a BMW i3 (102kg). However, the wheel motors still weigh more than a conventional wheel. With that in mind, the Protean Drives were fitted to a Volkswagen Golf, the suspension of which was tuned by an independent vehicle dynamics expert. According to Donaldson, the additional unsprung weight was managed successfully and the test car was made to handle as well as a standard VW Golf GTE. Eliminating transmission reduces friction losses by 6-8% compared with a conventional two-wheel electric drive system. The extra efficiency is a benefit during both acceleration and deceleration, so more energy is recovered during regenerative braking. The Protean Drive can be produced to fit wheel sizes from 14in to more than 20in. It is currently in pre-production and will be built in China, initially at the rate of five to ten units a week. Although there are significant packaging and efficiency benefits, the technology is more expensive than a conventional electric drivetrain and work is continuing to make it more price-competitive. “Although there are commercial benefits in using it,” says Donaldson, “nobody will pay more for it.” A Chinese vehicle manufacturer will be the first to adopt the technology this year. What is an in-wheel motor and how does it work? Like many EV motors, the Protean Drive is a permanent magnet-synchronous unit running on alternating current (AC), like a household appliance. Sitting between an AC motor and the direct current (DC) battery is an inverter that converts DC to AC to power the motor. During regenerative braking, the inverter converts the AC generated by the motor to charge the battery. Motors are usually separate and the vehicle manufacturer has to source a suitable inverter. The Protean Drive incorporates an inverter so can be used by an EV manufacturer on a ‘plug- and-play’ basis. 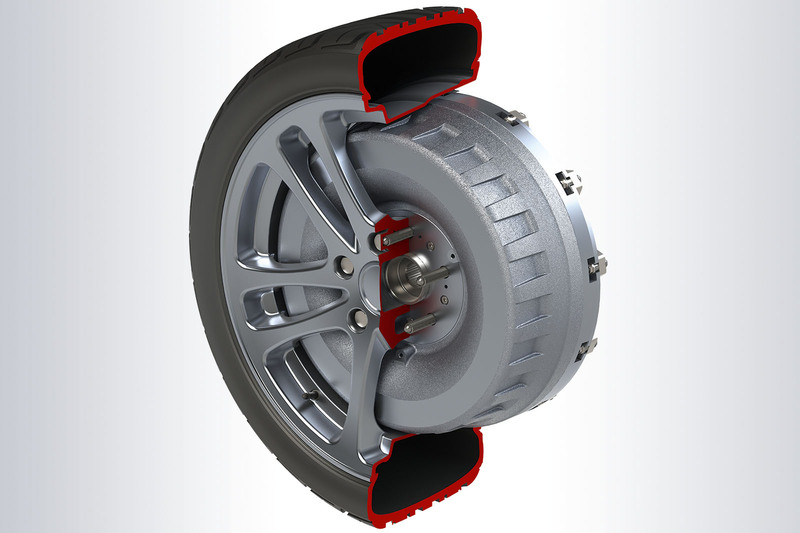 Protean Electric describes the new in-wheel design as an “inside out” motor. Traditionally, permanent magnets are mounted on a rotating central spindle called a rotor. This is surrounded by stationary electrical windings called the stator. In the Protean Drive, the rotor is on the outside and the stator on the inside. The motor drives the wheel directly and doesn’t require major modifications to the vehicle. Protean describes it as the “closest the auto industry may ever get to a bolt-on electric drive system”. These things better be really resistant, otherwise there's going to be some serious bills to pay. Having a brake caliper positioned there is on thing, but an electric motor? It'll be pounded to death. Where are the brakes? Even if regen can cause significant braking, it won’t satisfy legal requirements to have brakes on each wheel. And would drum brakes be sufficient? No. And where are you going to mount calipers for discs? And in the event of electrical failure, you’d need mechanical brakes to take over. And I wouldn’t be quite so dismissive of the sprung/unsprung issues. Sounds awful. All credit to this company for trying, but this really doesn’t look very promising. And it looks like there is a narrow open gap between the wheel and the inner drum within which very strong magnetic fields will operate, suppose it attracts some metal debris off the road and it gets jammed in there? sudden catostrophic wheel lock-up. This design is not new, its the same design as used in those Hoverboards kids ride or Segways, works fine for that but not sure I fance it on my car. Looking at the photo it seems that it has disc brakes, at the back is a disc and caliper. I don't see any brakes, why aren't they mentioned? The black disc with red segments looks like an electronics module of some sort. In board brakes are fine but they would have to manage the forward momentum of the outer wheel and motor on the same shaft, but this setup is supposed to eliminate driveshafts, so no clues. Also, I hope it's waterproof. Don't fancy it's chances after half an hour on a road salt and rain covered motorway. I've not seen a piece of legislation that actually mandates how a braking system operates. The MOT requirement is only that it is capable of slowing the vehicle at 0.5g. My suspicion is that this system is capable of doing this over a certain speed range so the motor is able to function as a brake. On a Tesla or Volt regen braking is limited by charging rate on the battery, if the motor is being used as a brake it will be able to dump heat to a resistor and then to air. The unsprung mass isn't that bad either once you remove the mass of the brakes and driveshafts. You could also arguably eventually integrate the wheel and the motor. Unsprung weight will be enormous. An additional 35kg per wheel in unsprung weight is HUGE, plus you need 2 motors instead of one so there's those issues as well. I wish them well but maybe they've trying to solve a problem that isn't there. Built in China, why?, if it’s a British Company, why can’t it be built in Britain, I have nothing against China, it just annoys me when a good product is developed it gets made somewhere else.